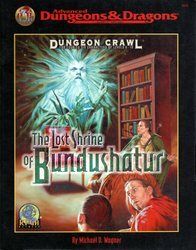 Originally bundled as special bonus packs of the Dungeoneer's Survival Guide, this rare module was never sold seperately. They have no cover, except the sleeve originally containing the whole bundle. 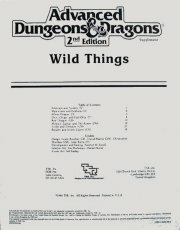 The module contains several mini-adventures featuring: Dracolich and Drow; Mindflayers; Goblins; Pyrohydra and Xorn; Aboleth and Cloakers; Ankheg; Jermlaine. 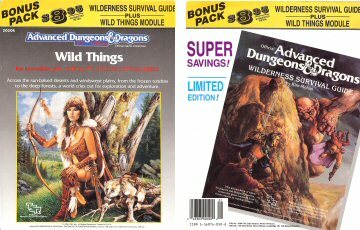 Originally bundled as special bonus packs of the Wilderness Survival Guide, this rare module was never sold seperately. They have no cover, except the sleeve originally containing the whole bundle. 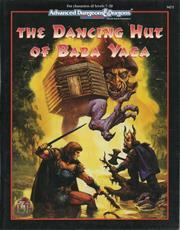 "The Dancing Hut ofBaba Yaga is an adventure designed to challenge high-level player characters (PCs). It has been structured for levels 7 through 20 and can be played with a variety of character classes. Characters below level 7 should not go adventuring in this module. The adventure pits the PCs in a battle of wits against Baba Yaga - an ancient and powerful sorceress - and against the extremely powerful, semi-sentient artifact she has created: her "dancing hut." It contains a mixture of problem-solving, combat, tricks and traps, and role-playing. While higher-level characters might be tempted to try to kill Baba Yaga and steal her hut, this is not the focus of the adventure. Instead, Baba Yaga is intended as a nonplayer character (NPC) who can have a recurring role in a campaign." "Sinister, twisting images...Horrific nightmares lurking at the corners of the mind...These are descriptions used to tell the tales of the Labyrinth of Madess. But these tales of the labyrinth are only legends, really, nothing more than stories used to frighten children at night - until a mysterious scepter is found, bearing within its crystal head a visage of insanity and terror, and also delivering a message: "Disturb not the Labyrinth of Madness again, and live a while longer." Now a powerful temple suffers from a tragic curse that is somehow linked to the labyrinth. Does there exist a group of heroes who can penetrate this dark and terrible place to life the curse...and survive? 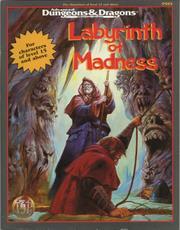 Labyrinth of Madness is a multiple-level, three- dimensional dungeon adventure, a puzzle within a puzzle, that commenorates 20 years of gaming with TSR." "The Autarch has a problem. His kingdom is on the brink of war, and his royal viziers tell him the only hope for the future lies in gaining three unique magical items, each of surpassing power. But the items are held by guardians of such evil that the viziers tremble at the though of facing one, let alone all three. Recovering those items means almost certain death. The Autarch glances down at his desk, noting a message from this morning. Spies report the arrival of adventurers, ones of some renown. Instantly, he has the solution to his problem. Adventurers can get those items. They'll do anything for money. 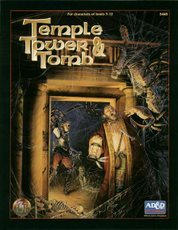 Temple, Tower, and Tomb is a trio of ruins to terrify the most courageous dungeon-crawler. 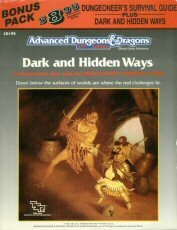 This AD&D 2nd Edition module can be fitted into almost any campaign or played as a stand-alone adventure. And good luck - you'll badly need it." 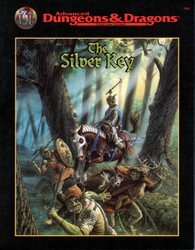 "The Silver Key is an AD&D adventure for two to six PCs of 2nd to 8th level. The PCs should have a total of at least 12 levels between them. One of the PCs should be a ranger or possess other significant woodcraft skills, one PC should speak orcish, and at least one PC should be skilled at sneaking, spying, and finding things out in an urban environment. While The Silver Key is written for a campaign with very few magical items, it could be adapted to a more conventional style with a minimum of DM effort. Given the difficulty and special circumstances of this adventure, the DM should use the negative hp rules even if they are not normally used in the campaign, as well as utilizing the optional nonweapon proficiency rules. Getting through The Silver Key requires a great deal of role-playing. The PCs will have to sneak, wheedle, talk fast, and generally do their best to avoid fighting. While there is plenty of material for players who enjoy a rousing combat, the players must be able to pick the correct moment to fight, or they will not succeed. 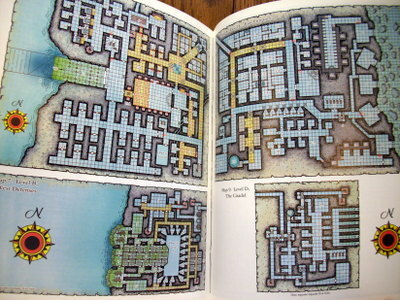 This adventure takes place in the human city of Honshar, which can be set in any game world. The campaign should have a history of antagonism and occasional fighting between orcs and humans (and their demihuman allies). In The Silver Key, orcs are about to attack Honshar. A human traitor has defected to the orcs after stealing the Ca'ega, a magical item vital to Honshar's defense. The PCs are transformed into orcs and sent to retrieve the Ca'ega and rescue the traitor (whom the Honsharians believe was captured by orcs). During most of the adventure, the PCs will remain in orc form. Chapter 1 presents background information on Honshar, discusses possible adventure hooks, and starts the adventure. The trip to the orc stronghold and the events inside it are covered by Chapters 2 and 3. Chapter 4 details the return journey to Honshar and the conclusions of the adventure." "Treasure Tales is a package of 16 separate adventures that will test player characters of all experience levels. Lured by thrilling tales of treasure and powerful magic, courageous PCs will find themselves exploring the ancient crypt of a cunning vampire, sailing the high seas in search of a fierce pirate, and traveling through the planes on a dangerous quest—to name just a few of the challenges that await. 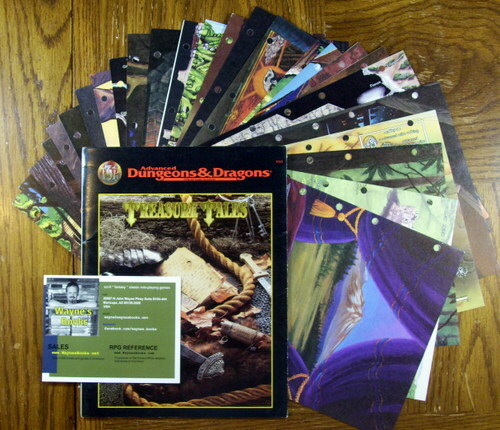 Each of the adventures contains two full-color reference aids, one for the players and one for the Dungeon Master. These beautifully rendered illustrations, diagrams, and maps have been specially designed as handouts to speed up game play. In addition, a list of folklore and rumors is provided to get each story rolling. These adventures can be easily dropped into any campaign world as brief interludes, or they can be expanded by the DM into epic quests that will provide weeks of fun for the entire group." "Once a generation, they say, a strange comet appears in the sky overhead and the gates of Firestorm Peak swing open. Twenty-seven years ago, your father led his band of adventurers into the mysterious mountain, never to return. Now the Dragon's Tear once more flickers in the sky, and the glass gates on the mountainside beckon. Will you pass through to discover the secrets that await beyond the portal none has ever dared and returned? 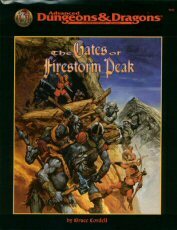 The Gates of Firestorm Peak is the first adventure designed especially for use with the new rules presented in the three Player's Option books: Combat & Tactics, Skills & Powers, and Spells & Magic. While it can also be played using just the AD&D game core rules (the Player's Handbook and the Dungeon Master Guide), this adventure offers a perfect oppurtunity to experience all the potential of the new optional rules. One of the highlights of this package is the first Player's Option player character record sheet. To meet the challenge of Firestorm Peak and escape with their lives, heroic adventurers must battle dark dwarves in their underground city, explore the abandoned caverns of the Elder Elves, and deal with weird alien entities from Beyond. Their goal is to stop the Master of the Twisted Caverns and his dark minions from completing his sinister plot before it's too late...if they can. Included in this product are a 96-page adventure book detailing the dungeon that lies beneath Firestorm Peak, 4 full-color poster maps detailing all the important locations in the complex, and a sheet of 56 counters for use with the tactical maps in major combats." "Behind every great hero is a story - a tale of brave deeds, cunning plans, self-sacrifice, and bold fortitude in the face of overwhelming odds. 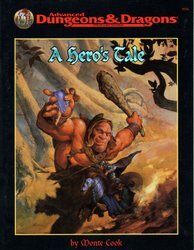 A Hero's Tale is a collection of nine short adventures, each slightly more challenging than the one before and suitable for any campaign world. Use them for a change of pace between larger quests or to sidetrack the heroes during major missions. Each adventure can stand alone, but if played in sequence they tell a connected, gradually unfolding tale of magic and chaos." 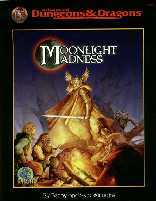 Moonlight Madness follows the exploits of six unlucky heroes trying to free themselves of the curse of lycanthropy while evading a full-scale werewolf hunt lead by a crusading paladin and his doughty army. Hermits, sphinxes, dinosaurs, pixies, Amazons, bandits, and a friendly game of "Dwarfenball" are only a few of the challenges that stand between the heroes and the cure they seek. Will they reach the Hermitage on the Lake in time, or succumb to Moonlight Madness?" "Long ago the Lords of Chaos strove with the forces of Law and were defeated. Their great temple destroyed and their minions scattered to the four winds, the Chaos Lords withdrew, and a new balance held sway in the land. But prophecy said that one day the fallen temple would rise again, heralding the Lords' return to spread Chaos across the world once more. And now comes a cry for help from the dwarves of Isar, saying that the Lost Shrine has risen from beneath the dark waters of the lake that kept it hidden for thirteen centuries. Already forces are gathering - some eager to plunder the temple's legendary treasures, some wishing to join under the Chaos Lords' banner, some desperate to destroy the shrine before the world they know is swept away. "Find the Chaos Key," says the prophecy. "The hand that holds the Key may shape the future." But will you be in time to be the one?" "Eternally does the Lord of Nessus scheme, and his designs are for all eternity; In the pit of Hell do the devils teem round his throne, and his reign is unchallenged; By the eight Dark Ones is he held supreme, and his name (speak it not!) is Asmodeus. To some, justice is more important than glory, duty is more important than desire, and goodness is more important than life. The great paladin Klysandral was such a man. But even the sleep of death, at the end of a long lifetime spent battling evil, did not bring peace to Klysandral. During his funeral, the entire Temple of Neheod was dragged by terrible magic into the Nine Hells, along with the soul of Klysandral and score of living mourners! What unearthly motive could be behind this tragedy? Only the bravest, strongest, and most resolute heroes will have the mettle to fing the answer. Along the way, they will meet the enigmatic wizard Emirikol the Chaotic, sail aboard the fiendish ship Demonwing, and finally face the horrific minions and overwhelming terrors of Hell itself. Only the path of light can lead the bravest of the brave into perdition and safely out again. Step wisely, and walk in justice." "From time out of mind, the standing stones known as the Circle of Cahervaniel have stood lonely vigil on a grassy hilltop. Sheepherders once moved their flocks over the hill and through the circle, sometimes resting in the cool shadows cast by the ancient stones. Everything changed when a stone finger fell, revealing a fissure in the earth. Now, dark shadows caress the circle after the sun sets. Creatures out of nightmare dance upon the hillside at night. Many swear that a unicorn of deepest ebony now hunts all upon two legs who draw near, while stunted creatures scurry in the shadows, abducting sheep from their sheds and drawing them down below ground for food. 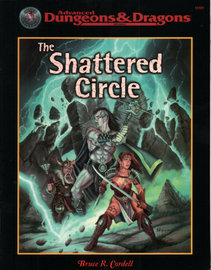 The Shattered Circle is a stand-alone adventure in which low-level characters explore an ancient dungeon long hidden below the ground. Accomplished players with new characters will find this adventure fun and challenging, but it can also serve as a beginner's first taste of the AD&D game." "Trouble stirs in Dunador! The King lies dead of a wound received during a hunting expedition. His brother, Lord Edrin, challenges the rightful Crown Prince, a half-trained young man named Edmund, for possession of the throne while Edmund travels on a pilgrimage to the holy shrine of Nevron. Forces throughout the kingdom vie for control of the realm. Can the player characters find the Crown Prince and protect him from the treacherous forces at large in Dunador? 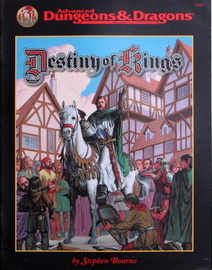 Destiny of Kings is a classic AD&D game adventure fully updated for use with the 2nd Edition rules." "The road to adventure is fraught with danger. Travel swiftly, and guard yourselves well. Grakhirt's Lair by John Nephew: The villain responsible for the bloody battle at Nolivari remains at large. Catch him before he attacks again. Trouble At Grog's by Grant and David Boucher: When a crime wave threatens the town of Dagger Rock, a half-ogre innkeeper calls upon brave heroes to find the culprits. The Stolen Power by Robert Kelk: The priests of Highland need help to catch a thief and recover a book of infinite spells from his wilderness retreat. The Matchmakers by Patricia Nead Elrod: A love affair torn by treachery threatens to plunge the city of Povero into civil war. Roarwater Caves by Willie Walsh: A xvart shaman needs brave heroes to attack his own lair, but are the perils worth the reward? The Inheritance by Paul Culotta: A keep on the edge of civilization has fallen to the ruthless Lostafinga tribe. Remove the threat, and claim the castle as your prize! 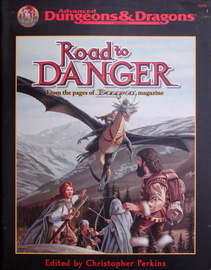 Road to Danger is a collection of low-level adventures for the Advanced Dungeons & Dragons game. Each adventure stands alone, but any or all of them can be inserted easily into an ongoing AD&D campaign designed to challenge low-level characters and prepare them for even greater dangers down the road!" "The rediscovery of an artifact forged at the dawn of time signals an age of strife and oppurtunity! The dwarven clans are in chaos, and a powerful host of goblins stands poised to sweep over the land in a wave of death and terror. Only the Axe of the Dwarvish Lords - one of the most powerful weapons ever created by the dwarven race - holds the key to ultimate victory against the massing humanoids. Can the PCs brave the labyrinth of an abandoned dwarven stronghold to find the Axe? It's up to your characters to write a new chapter in the saga of the Axe. 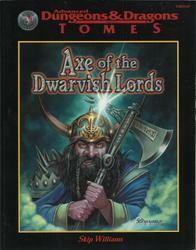 This book contains the full story of the Axe's creation, loss, and reappearance. For five to seven characters of levels 13-15." "Herpulh the goblin heard a knock-knock-knocking in the upper corridor - those nosy explorers have found the secret entrance to the goblin den! Herpulh must hurry to warn the tribe. If the invaders cut him off at the pass, there will be no means of stopping their mad advance into the lair! 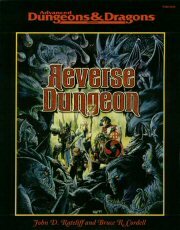 Welcome to Reverse Dungeon the adventure where everything is backward! Instead of playing bold heroes who venture into dens of evil, the players take the roles of the monsters, determined to stop adventurers from invading their homes. Instead of always being the good guys, the players get a chance to be the bad guys. * Ancient undead that must defend the silence of their tomb against crusading clerics intent on detroying them. Enter the Reverse Dungeon - and find out how it feels to be on the receiving end of a hero's blade." "The quest for honor and the search for treasure sometimes leads to death and despair. Caermor by Nigel D. Findley: True evil walks among the villagers of Caermor. You must uncover the danger in time to save the village from destruction. The Moor-Tomb Map by Jon Bailey: A mysterious maps lead you into the perilous Willowmoors and, with any luck, the lost tomb of Dalavan Meir. The Cauldron of Plenty by Willie Walsh: The king wants it. The giant has it. Do you have the gall or the guile to take it? King Oleg's Dilemma by Lee Sheppard: An alliance with the dwarves would solve many of King Oleg's problems, but reaching the dwarves is eaiser said than done. Encounter in the Wildwood by Willie Walsh: A trek through the wood pits heroes against a truly monstrous band of brigands. Masqueraider by Randy Maxwell: Journey to a haunted valley to find the elusive marauder that threatens the town of Tyrluk. 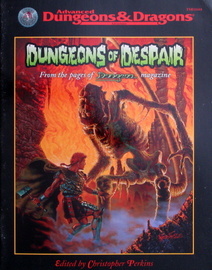 Dungeons of Despair is a collection of low-level adventures for the Advanced Dungeons & Dragons game. Each adventure stands alone, but any of them can be inserted easily into an ongoing AD&D campaign. They can also be played as follow-up adventures to those presented in Road to Danger, the first anthology of adventures taken from the pages of Dungeon Adventures." 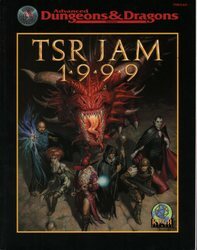 This compilation of aventures from TSR's popular Adventurer's Guild program brings together adventures from the Forgotten Realms, Greyhawk, Planescape, and Ravenloft campaign settings, the Dragonlance: Fifth Age campaign setting (using the Saga game rules), The Illithiad Monstrous Arcana sourcebook, and the Alternity science fiction roleplaying game. * Take on the Cult of the Dragon and their undead dragon servitors! * Join a band of githzerai's pursuit of their mortal foes, the mind flayers of Kawarlenaa! * Help a rogue tanar'ri hunt the Jabberwock with a vorpal sword! * Struggle with a master vampire and The Whistling Fiend for a Key to the Abyss! * Defy the great sea dragon Brine in an undersea quest for the good folk of Port Balifor! * Engage in a game of "capture the flag" with bizarre aliens, while the fate of an entire world hinges on the outcome! Are you up to the challenge?" 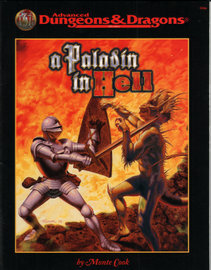 "This action-packed epic takes the world of the DIABLO II computer game and translates it into the ultimate AD&D adventure. 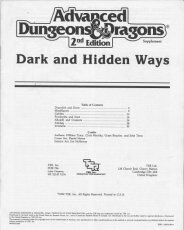 You can create AD&D heroes with a DIABLO twist or use heroes from any AD&D campaign, then send them off to challenge terrors once found only on a computer screen. The adventure starts in Tristram, the battleground of the original DIABLO game, where Diablo, Lord of Terror, rules a legion of demons. There, the heroes explore the mysterious Monastery - full of dangers and challenges pulled right from DIABLO but enhanced for your tabletop game! More than a dozen hellacious dungeon levels! Five new PC kits straight out of the computer game! More than 100 lethal new monsters, including dozens of death-defying demons! More than 100 new spells and proficiencies! And - get this - over 1,000,000 new magical items for the AD&D game!" To everything there is a season. Every campaign has to come to and end sometime, so why not go out with a bang? 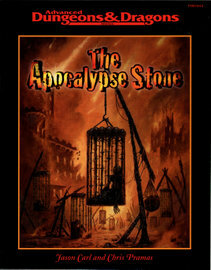 The Apocalypse Stone is an epic adventure to challenge high-level characters, but beware - it will destroy your world! This adventure has it all: gods and devils, plague and pestilence, rains of fire, and world-shattering conflicts. Here is an opportunity for PCs to display undreamt-of heroism...or fall to ultimate defeat. The Apocalypse Stone is a tool for Dungeon Masters to present extremely challenging encounters for high-level parties, to wrap up a long-running campaign... or both." "A hideous death cult has seized control of an ancient artifact-monument known as Tovag Baragu. The power behind the cult is the Old One himself, Iuz the Evil, demonic master of an empire. He's on an all-or-nothing quest for supremacy over the world - and the heavens beyond. To stop him, heroes must face horrors never dreamed of, journeying to a shadowed city where Death rules and the living cower. Here, Iuz will achieve his mad dream by destroying imprisoned master of that alien citadel - Vecna, the mightiest lich, an immortal demigod. Two items exist with the power to stop Iuz - the Eye and the Hand of Vecna - but using them carries fantastic risks. Not even the gods kmow what will be unleashed when these items are fully activated. 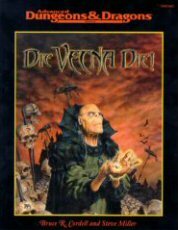 Die Vecna Die! 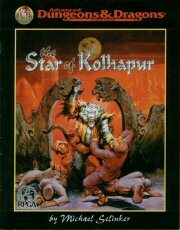 takes the heroes from the GREYHAWK campaign to the demiplane of RAVENLOFT and then to the PLANESCAPE city of Sigil. However, none of the material from those settings is required for play." "When the fabled Star of Kolhapur gem is stolen, Rajah Shivaji is rightfully incensed. He blames the Thugs, vicious murdering worshippers of the black goddess Kali. But the thugs are not the only dangers in this land. Fiendish spirits wander the city, thieves prowl the streets of Kolhapur, and something even more sinister emerges at night..."
"It's war! 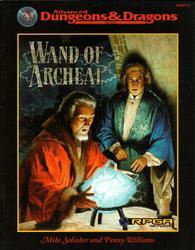 The long-standing dispute between the Celestial Order Wizards and the Mages of the Red Cabal erupts into open warfare as the two rival factions try to retrieve pieces of an artifact before it's too late. At last it happens—one of the Celestial Order's highest-ranking mages is slain in a surprise attack by the Cabal. Or is he? It's up to you to penetrate the enemy's hidden base, find Archeal and his famous wand, and bring them back to safety." "Under raging storm clouds, a lone figure stands upon the ancient walls of Castle Ravenloft. Lightning splits the sky, its cold light revealing a tall form wrapped in a billowing cape of shadows. Another flash exposes a face full of power and madness, contorted by a tragedy darker than the night. Far below, a party of adventurers has entered his dread domain. He smiles. Another lightning bolt rips through the night, but the figure is gone. Only a howling wind fills the midnight air. The master of Castle Ravenloft is having guests for dinner - and you're invited! 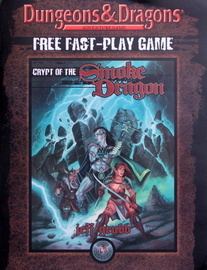 Originally published in 1985, this classic adventure for four to eight characters of levels 5 to 7 mixes elements of gothic horror with AD&D fantasy for a unique experience. 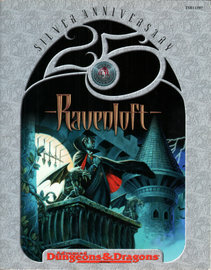 Updated to 2nd Edition, Ravenloft features a haunted castle, gypsy fortunetellers, a tragic back story, and a vampire who is as powerful and intelligent as he is frightening - a menace worthy of the bravest adventuring party!" "Welcome to Worlds of Adventure If you liked this Fast Play Game, you'll love the Dungeons & Dragons Adventure Game! It's a great way to learn the game and start playing now. It includes everything you need to play. Play the World's Greatest Game!"